Created by Chris Boucher (Blake's 7, Doctor Who), British sci-fi TV series Star Cops was first broadcast on BBC2 in 1987. Nine episodes were made and this May Star Cops returns on audio from Big Finish. It’s the near future and mankind has expanded its presence in space. Maintaining law and order among this network of space stations, satellites and moon outposts is the responsibility of the International Space Police Force, known colloquially as the Star Cops. While dealing with crimes including drug smuggling and murder, the Star Cops find themselves facing a new and sustained threat. The activist group Mother Earth, ideologically opposed to humanity’s presence in space, has been quiet for some time. But no longer. The group returns with a vengeance, prepared it seems to go to any lengths to achieve its aims. Returning to Star Cops are three original cast members: David Calder (Call the Midwife, Motherland, Inside No 9) as Nathan Spring; Trevor Cooper (This Country, Downton Abbey, Doctor Who) as Colin Devis; and Linda Newton (All Saints, My Two Wives) as Pal Kenzy. And today we can reveal the cover art and story details for the first four stories in Star Cops: Mother Earth Part 1. As construction of the Vasco da Gama, the largest space station ever put into orbit, nears completion, Nathan is visited by an old friend, who asks for his help in tracking down a missing undercover officer. Meanwhile, Inspector Priya Basu is investigating a near-fatal spacewalk accident on the space station Rakesh Sharma that may be no accident at all. A murder at the historic scene of the first Apollo moon landing offers few clues for the Star Cops. Why would anyone want to kill Philip Hughes, a property entrepreneur? And what has become of the mysterious woman who was with him at the time? The investigation leads to a moon Outpost, where anyone may be the killer. Tech Tower is a state of the art, high-security, high-technology building located in Paris. It seems the ideal venue for an international conference on how to counter the growing threat from the Mother Earth group. Nathan and Priya attend as representatives of space policing. Soon, they and everyone else in the building find themselves in danger, as a disruptive attack by Mother Earth coincides with a plot by criminals to carry out a high stakes robbery. A failed bombing of Moonbase provides the Star Cops with an opportunity to strike back at Mother Earth. Paul Bailey is called on to use his undercover skills once more. But Mother Earth is about to escalate its campaign of violence with a spectacular attack. And the Star Cops are among those in the firing line. Joining the Star Cops for this twenty-first century edition are Rakhee Thakrar (Eastenders, Doctor Who) as Inspector Priya Basu, and Philip Olivier (Brookside, Doctor Who) as undercover Star Cop Paul Bailey. 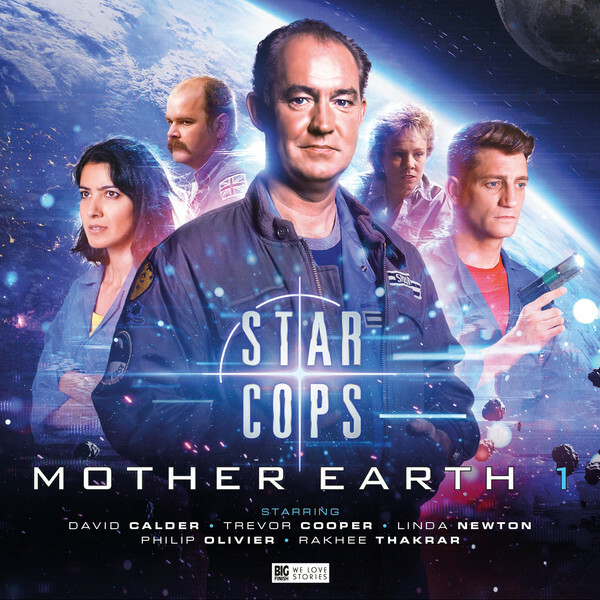 You can pre-order Star Cops: Mother Earth Part 1 at £28 on CD or £25 on download ahead of its return in May. Don’t forget that each CD purchase unlocks a download option on the Big Finish app and the Big Finish website. Or you can save money in a bundle. Pre-order Star Cops: Mother Earth Parts 1 and 2 together for £50 on CD or £45 on download. Keep an eye on the Big Finish website for more information and trailers from the intergalactic world of Star Cops.